The farm was located in central Portugal. It had 200 sows in production, at 18 kilos. The case presented in 2008, after the grain price crisis of 2006. In March of 2008 their genetics supplier was changed for a local supplier offering better prices. The farm had been losing money for a long time and had to try and reduce costs, so, after leveraging some payments, the decision to change genetics was made. 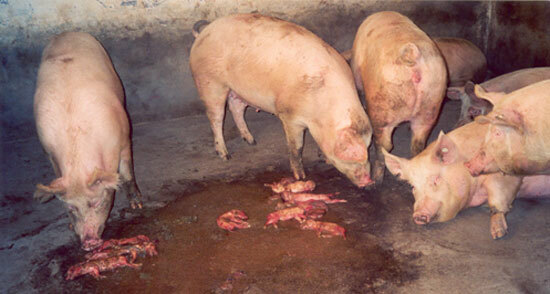 The farm presented with a conventional health status; positive for PRRS, M. hyo, S. suis, mange and atrophic rhinitis. The farm also had its own AI center. Live Aujeszky's disease every 3 months. Blanket live PRRS in October and November. On June 6, 2008, the farmer called the veterinarian for help. On the phone, the farmer was very upset and expressed that he had a very serious abortion problem. Upon trying to calm him down we realized the scope of the tragedy. We asked him which sows were aborting and he told us the problem was mainly with the first parity sows (we should note that these were the first sows from the new supplier) although he also commented that some second parity sows had aborted as well. When we asked about the percentage of abortions we were even more alarmed; abortions occurred in 90% of first parity sows and in 10% of second parity sows. 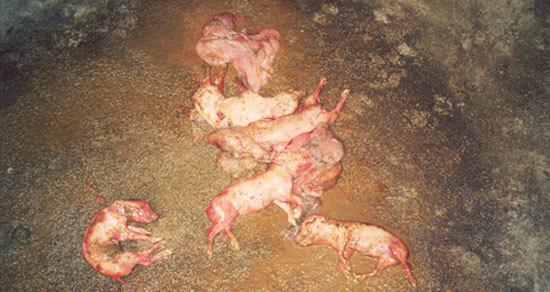 Given that 90% of the sows aborted in the first farrowing, we deduced that they occurred in a very wide range, between 30 and 109 days. When we asked about the range, our suspicions were confirmed. He sent us the following photos taken with his cell phone. The photographs corroborated the fact of the matter. At this point we decided to visit the farm. Due to scheduling conflicts the visit was scheduled on June 30th. At the time of the visit, 80 abortions were counted, and photos were taken that same day of some of the abortions and vaginal discharge. While visiting, we could see that no other stages were affected, nor did we detect any other clinical signs. The farmer confirmed that only some sows had stopped eating, there were no high fevers, only 20% had had a fever at all, the rest had none. We were looking for an environmental cause that could explain the abortions but found none. The ambient temperature was not too high, there were no excessive drafts and there was no place specific to the abortions. It was noted that the miscarriages had occurred not just in gestation but also in maternity. It was also confirmed that outside of the abortions, there were no other reproductive problems and there was no increase in stillbirths or fertility problems (this remained between 80-85%). The only thing observed, as mentioned before, was vaginal discharge. Given this scenario, we decided to do serological tests and send some fetuses while watching the feed quality. The lab did not find anything relevant pathologically, but upon a feed analysis the presence of mycotoxins was detected, although at tolerable levels. We decided then to undertake the use of adsorbents in the feed. Unfortunately, the abortions continued and in December of that year we made another visit in which we were unable to detect anything new. At this point we decided to perform new serological exams and fetal monitoring, but this time we added a hemographic profile of 18 sows.